So you wake up in Prague and you know a whole day is ahead of you dedicated just for exploring this colorful city. Are you excited? Well of course 🙂 . The target for the one whole day we spent in Prague was to visit the main sights in the old city center (this time during the day) and to visit the castle of Prague. As I have stated in my previous post, we were just a few metro stations away from the city center, so after having a delicious breakfast at the hotel, we headed off to the city center. Again, we were confronted with a lot of small, winding streets: our job to find stuff did not get much better compared to the previous evening. We were actually targeting the castle for the first half of the day, with the city center “reserved” for the second part. Getting to the castle, however, took us through the old city center, so before we knew it, we were standing in front of the Astronomical Clock, so we had a few photos taken, but basically we were just trying not to get hit by someone and to get out of the photos of others. The crowd was a bit disturbingly dense… Anyway, the city was quickly getting alive, so we decided not to get spun off our target and looked for signs to take us to Karluv most (a.k.a. Charles Bridge) which seemed like the ideal place to cross to river to get to the side where the castle is. The bridge itself, although it is a simple arched bridge, is pretty impressive especially taking into account its age and the baroque statues it is decorated with. It also gives a pretty impressive view of the castle. But again, it was full of people, so we did not really spend too much time on it and went on instead towards the castle. We climbed quite an impressive number of stairs to the castle, but eventually we got up before the crowd (or at least that is what we thought). We did not really know where the entrance to the castle was, so we decided to had a walk in the small park with a beautiful view of the city. We eventually got to an entrance, which to our surprise was actually the back entrance. This meant we had to go all the way back (this time within the castle walls though) to almost the spot we were at the beginning to buy tickets. 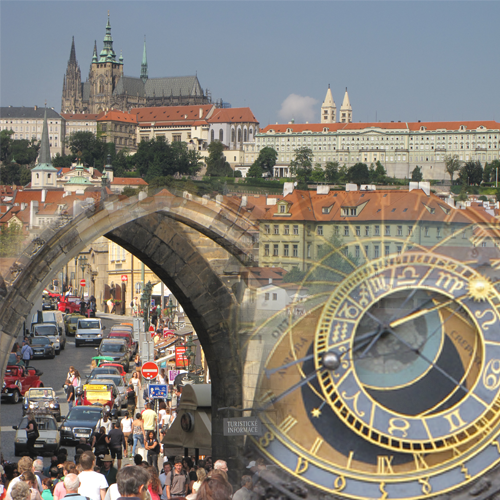 We bought a Prague castle long visit ticket which entitled us to visit most of the sites without the need to additionally pay at each place. I must say the castle is pretty impressive and I think most sites are worth a visit. I especially liked St. Vitus Cathedral: I think it is one of the most impressive cathedrals in it’s class. We went to have dinner at a place recommended by a lot of people: U Fleku, a very rustic place where they seem to have an unlimited amount of beer and food for everyone. Do not expect to get an easy meal, when you order chicken here: here chicken means half a chicken (all inclusive). The beer itself is heavy and they simply serve you as you sit down, without a lot of questions asked. Anyway, we had an interesting dinner and I think we understood what eating out in Prague really means: beer, beer, heavy food and fun 🙂 . Again, here’s the link with a selection of photos we took. After the two cities on the Danube river, we decided to go north and visit a city on a different river: a city built on the banks of the Vltava called Prague. 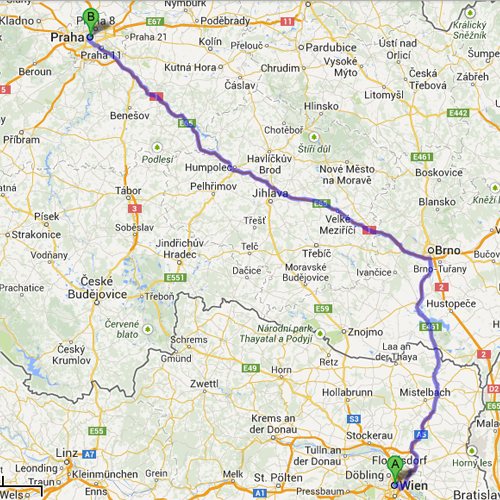 Before getting there, however, we had a quite long drive from Vienna to do and not all of it was on a highway. The shortest way of getting from Vienna to Prague is to go north from Vienna towards Mikulov at first on the A5 highway and then on a two-lane road packed with a long queue of cars heading to all countries north of Austria. After passing the border, the first settlement on the Czech side is Mikulov, where we had our first encounter with some of the locals, because we had to stop for fuel and for a vignette (€10.00 for 10 days). – Lady (in split second giving the vignette): “Yes”. I guess this was THE place where everyone bought their vignettes. She even gave me directions to fill in the vignette: “Car number here, car number here” (I had to fill in the license plate number in two locations before sticking it onto the bumper). So, after resolving all issues with the car, all we had to do is follow the road towards Brno and then the highway towards Prague. Now this portion was a bit of a disappointment… let’s just say it is best to visit the toilet before driving too much on it… the train makes less noise, than the car while driving on it 😀 . On the good side, however (which is good only in the long run), they were already working on repairing the highway and in several sections we could only drive on one lane (this was the bad part for us), but in the end we arrived to Prague with very little delay and we have found our hotel quite easily. The hotel itself was located on the Na Celné street so with a few go-rounds until we found a parking place (there was 0 space in front of the hotel) we checked in. I must say in the end I was quite happy that we did not find a parking spot in front of the hotel, because we did find one in front of the Staropramen brewery (a spot we would have probably never bumped into otherwise). The hotel itself was a quite a refreshing site after the one in Vienna. It looked and smelled fresh and friendly with a visible attention to details. The only minus which they managed quite well, was the small parking lot: I think they have fit 10+ cars in an area where normally around 4-5 would fit. I had to leave the key at the front desk, so that in case a car from the back had to come out, they could move all cars standing in the way. Luckily during the stay they had to move it once, and there was not a scratch on it 😉 . For almost the same price as the hotel in Vienna, this was a much better value for money (and we even had our breakfast included here). After checking in, we headed to the closest metro station, the Anděl station (using the guides and free map given at the hotel), to buy tickets. We decided to buy 30 minute tickets instead of full 24 hour tickets, because we did not plan to travel by public transport that much, and because we planned to stay more than 24 hours, so it would not have been enough. Again, I was happily disappointed by the fact, that the old lady behind the window spoke almost perfect English, so we bought the tickets quite easily and headed towards the city center right until the Mustek station. Posted in Czech Republic, Travel | Comments Off on Do You Speak English?